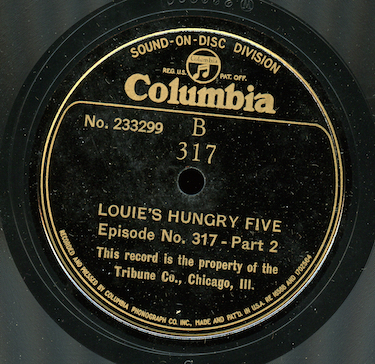 And, following up from our previous post, here’s the other side of the disc with part of program 6 in the series “Louie’s Hungry Five”. The band continues their adventure on a carnival ride. Our program was transferred from an original Marsh Laboratories Electra shellac 12” transcription, matrix number 6077. 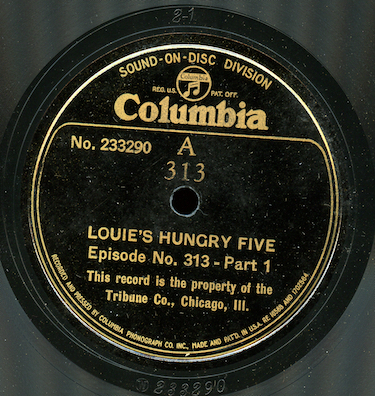 Some months ago, I posted a sequence of early radio serial broadcasts by the “Little German Band”, “Louie’s Hungry Five”, which originated at WGN in Chicago. The series was developed by the station after they lost “Amps n’ Andy” so they could cash in on the lucrative syndication transcription market. The shows I posted a few months ago dated from 1931. Doug Hopkinson and Ryan Ellett produced a detailed and illustrated article about the series that tells the story much better than I can. 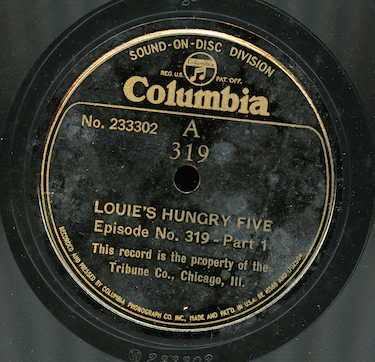 Next up on the blog, part of two earlier “Louie’s Hungry Five” broadcasts, probably dating from late 1930. 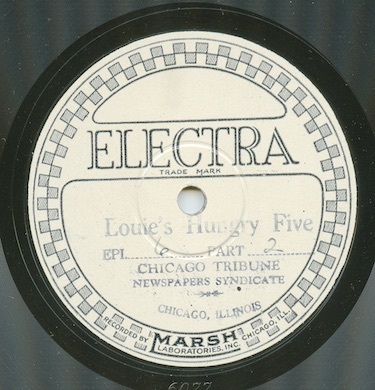 While the later discs I posted previously were pressed by Columbia, here’s a disc recorded at Marsh Laboratories and likely distributed just a few weeks after the syndicated show debuted in October 1930. In program 5 of the series, the band is at some kind of carnival and walking through an attraction with funhouse mirrors. We only hear the second part of the show on this disc. The show was transferred from an original Marsh Laboratories Electra shellac 12” transcription, matrix number 6075. 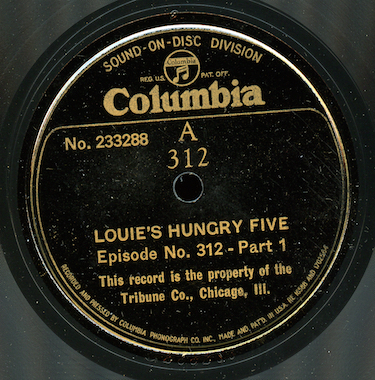 Now we reach the end of our twenty episode run of “Louie’s Hungry Five”, an early radio comedy serial about the “little German band” syndicated by WGN-The Tribune Company. It’s been a pleasure to offer this programs on the blog with the rarely seen original cue sheets - the 78 rpm transcriptions are in excellent shape for this seldom heard program. 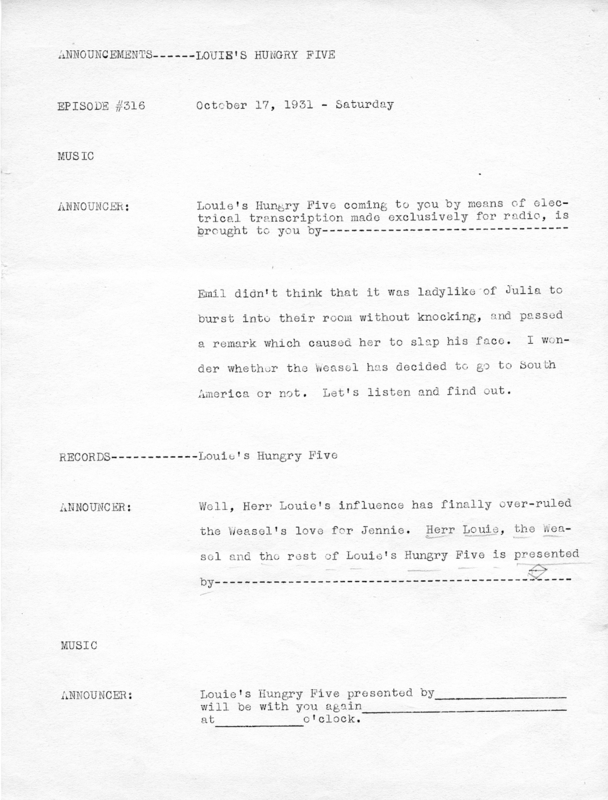 Program 319 was originally heard on October 21, 1931. Louie and the band are on the train and have almost arrived in New York. You can look at the original local announcer’s cue sheet for the program as a jpeg here. Our mp3 was transferred from a set of two 12” laminated shellac 78 rpm transcriptions pressed by the Columbia Sound-On-Disc Division, matrix numbers 233302 and 233303. I really enjoyed transferring the shows - I hope you found it interesting to have this brief glimpse into early radio. 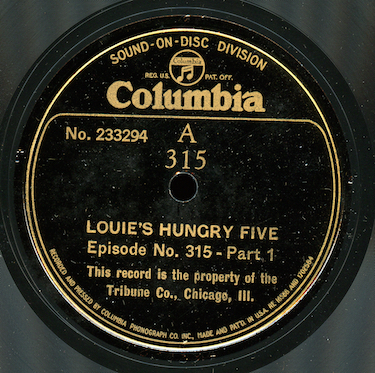 Here’s our next-to-last visit with the “little German band” with another episode in “Louie’s Hungry Five”, syndicated by WGN-The Tribune Company. 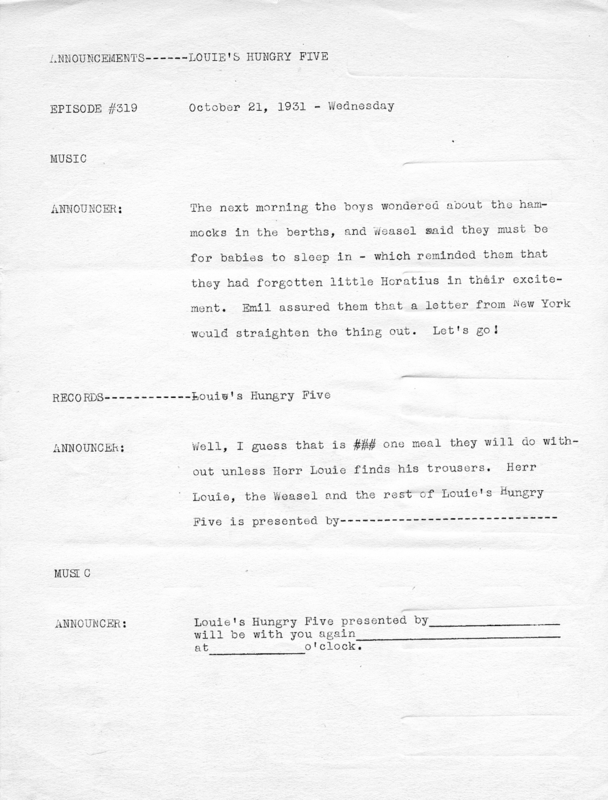 Program 318 was originally heard October 20, 1931. Louie and Emil are figuring out how to deal with how to sleep on the train as they head to New York for their trip to South America. You can look at the original local announcer’s cue sheet for the program as a jpeg here. Our mp3 was transferred from a set of two 12” laminated shellac 78 rpm transcriptions pressed by the Columbia Sound-On-Disc Division, matrix numbers 233300 and 233301. 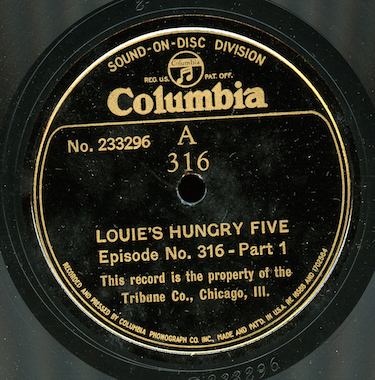 We’re nearing the end of our consecutive twenty episode run of the early radio comedy serial about the “little German band”, “Louie’s Hungry Five”, syndicated by WGN-The Tribune Company, Chicago. Program 317 was originally broadcast on October 19, 1931. The band finally boards the train for New York. You can download the original cue sheet for the local announcer here. Our mp3 was transferred from a set of two 12” laminated shellac 78 rpm transcriptions pressed by the Columbia Sound-On-Disc Division, matrix numbers 233298 and 233299. 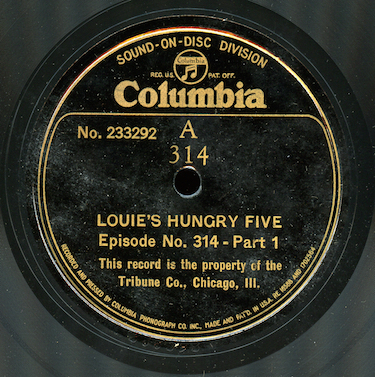 Only a few more episodes are left in our consecutive twenty episode run of the early radio comedy serial, “Louie’s Hungry Five”, syndicated by WGN-The Tribune Company, Chicago. 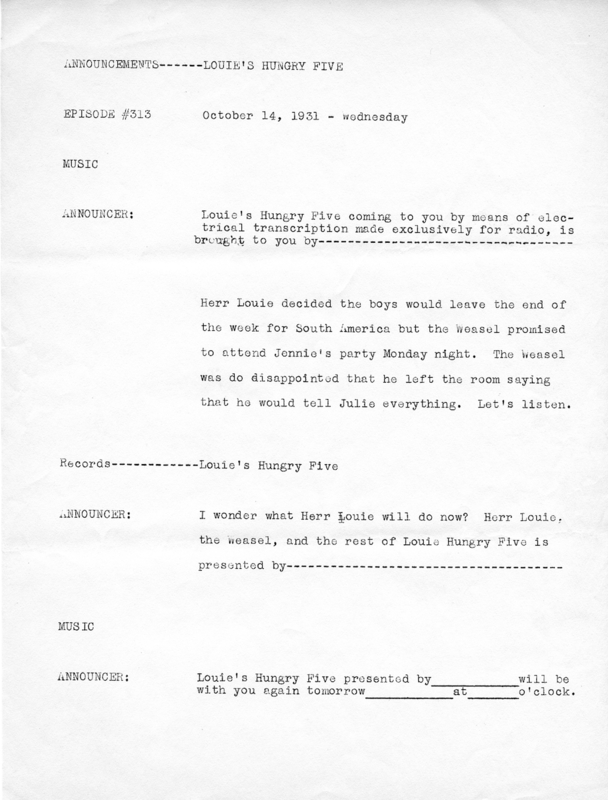 Program 316 was originally heard October 17, 1931. Louie talks with the hotel clerk about their reason for going to South America - an invention that will let them go into the cocoanut ice cream pie business. 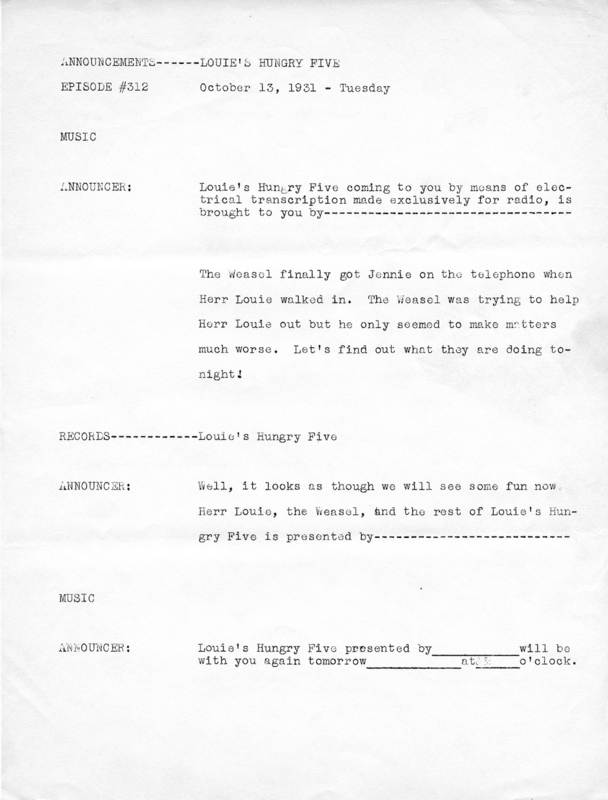 You can download the original local announcer’s cue sheet here. Our mp3 was transferred from a set of two 12” laminated shellac 78 rpm transcriptions pressed by the Columbia Sound-On-Disc Division, matrix numbers 233296 and 233297. 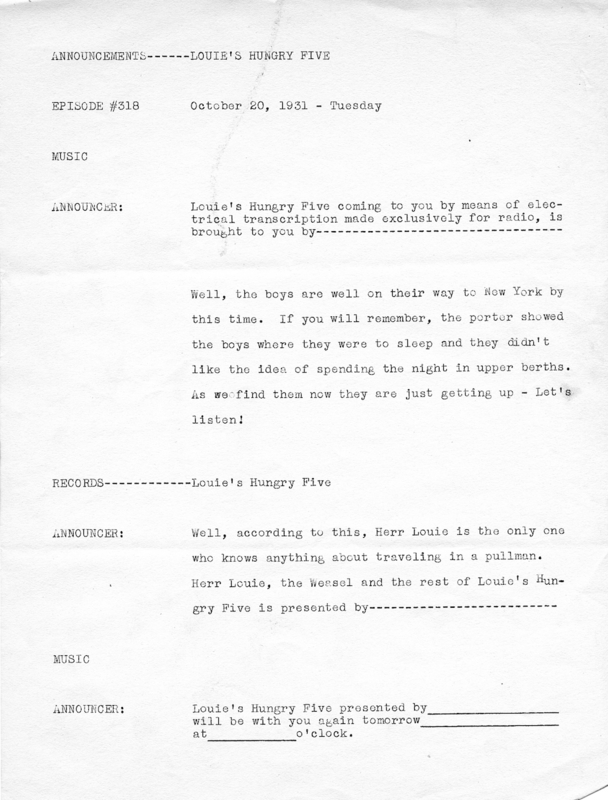 We only have a few more shows in our run of twenty consecutive episodes of the early syndicated comedy serial, “Louie’s Hungry Five”, originating with WGN, the Tribune Company, in Chicago. Program 315 was originally heard October 16, 1931. The group is still planning their trip to South America. 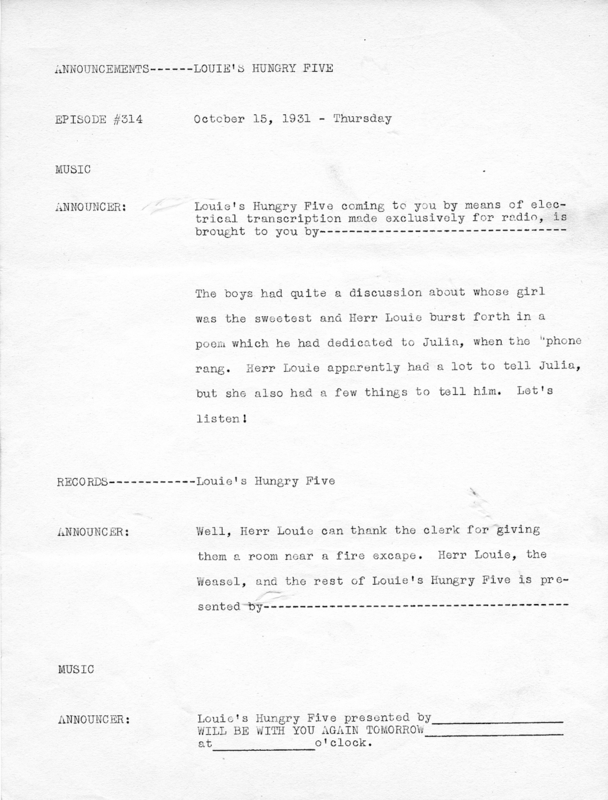 In this episode, Emil and the other members of the group talk with Louie about him leaving them to face Louie’s girlfriend, Julia, when she was angry at Louie. You can see the original local announcer’s cue sheet for the program here. Our mp3 was transferred from a set of two 12” laminated shellac 78 rpm transcriptions pressed by the Columbia Sound-On-Disc Division, matrix numbers 233294 and 233295. Let’s join the “little German band” once again in “Louie’s Hungry Five”, an early syndicated comedy serial from WGN-The Tribune Company. Program 314 was originally broadcast October 15, 1931. Louie is mad at Emil because he has mixed up things between Louie and his girlfriend, Julia. To cheer up Louie, the band plays a wonderful version of “The Peanut Vendor”. 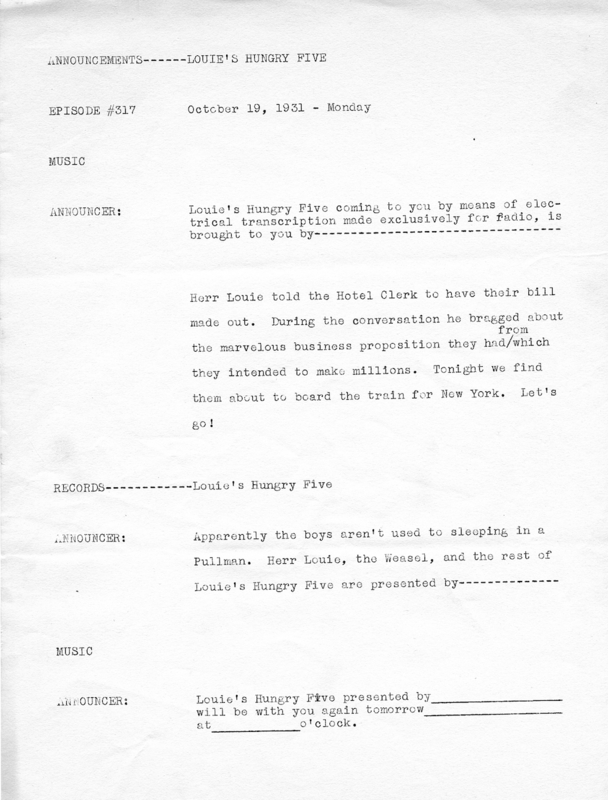 You can download the original local announcer's cue sheet for the episode here. 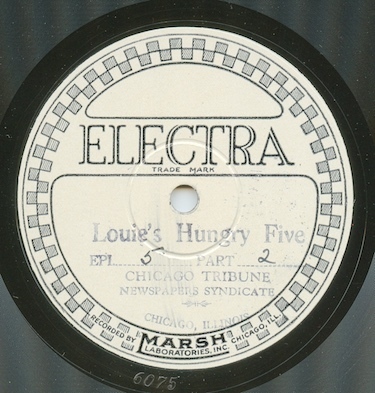 Our program was digitized from two original 12” shellac Columbia Sound-On-Disc Division 78 rpm transcriptions, matrix numbers 233292 and 2933293. Let’s find out what’s happening with the “little German band” in “Louie’s Hungry Five”. Louie, Emil and the rest of the band are preparing for their trip to South America. Louie and Emil get into an argument about their girlfriends. The secret is out about Louie pretending to his girlfriend that he broke his leg to cover up the auction of their household items for their trip. 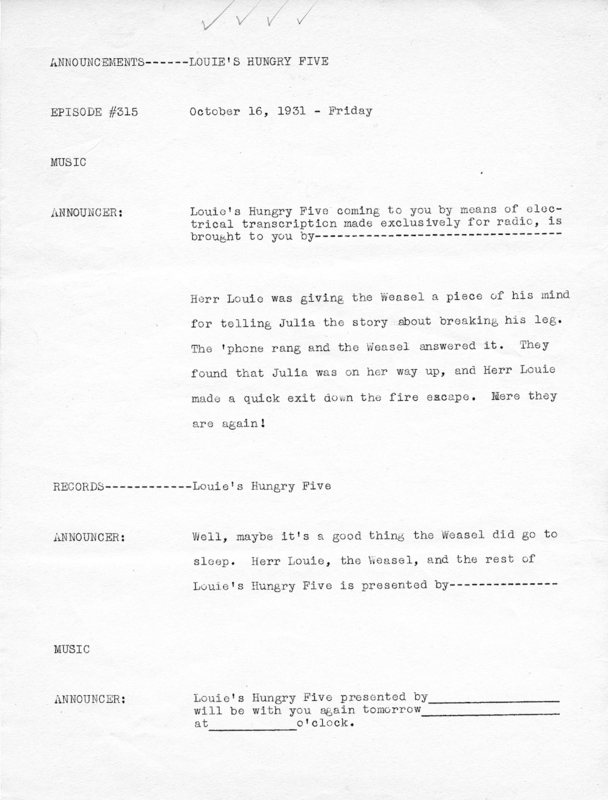 You can see a jpeg of the original local announcer's cue sheet for the show here. Our show was transferred from a set of two original twelve inch laminated shellac Columbia Sound-on-Disc Division transcriptions, matrix numbers 233290 and 233291. 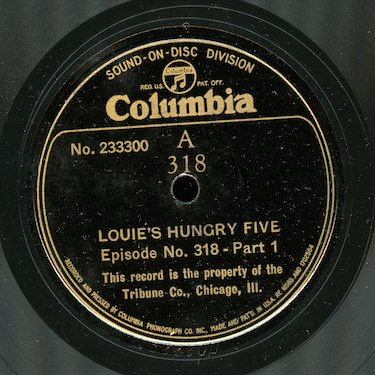 And now, another in our twenty episode run of “Louie’s Hungry Five”, an early 30s radio comedy serial syndicated by WGN-The Tribune Company. Louie and the group are staying at a hotel, getting ready for their trip to South America. In program 312, intended for broadcast October 13, 1931, they plan on leaving in a few days, but Emil has been invited to a house warming party by his girlfriend and wants the trip postponed. You can see a jpeg of the original local announcer’s cue sheet for the program here. Our mp3 was transferred from two twelve inch Columbia Sound-On-Disc 78 rpm transcriptions, matrix numbers 233288 and 233289.